“The project plans to hold its preliminary design review in August 2018 and its confirmation review in October 2018 on schedule, at which point the project will establish its cost and schedule baseline,” the GAO report stated. The orbiter’s 10 scientific instruments include ice-penetrating radar that will look below the moon’s outer surface. Providing sufficient power for all these instruments during the spacecraft’s nominal three-year science mission could pose a challenge. “The project is currently meeting JPL mass and power margin requirements, but is evaluating design options that may affect the mass and power needed to operate the spacecraft and its 10 instruments,” the assessment found. “For example, accommodation of the ice-penetrating radar has been difficult because it requires a higher-than-expected amount of power that could lead to design trades. Finding materials for the spacecraft’s solar arrays has been a challenge. The original materials selected did not meet requirements under low temperatures. “As a result, the project changed the materials it plans to use and is exploring using a different vendor for the solar arrays,” the report stated. Under law, Europa Clipper must be launched on the Space Launch System (SLS). Project officials support using the giant booster because it could reduce travel time to Jupiter’s moon by approximately 4.5 years, the assessment stated. Frequent delays in the SLS schedule could push Europa’s launch readiness date beyond June 2022. As a result, the program is keeping its launch options open. The mission has also faced workforce shortages at NASA’s Jet Propulsion Laboratory in several key areas since October 2016. However, program officials have reported progress in addressing this shortfall. GAO did not conduct an assessment of the Europa lander, which is a separate mission still in the pre-formulation stage. Launch of that mission is currently schedule for 2024. The GAO’s assessment of the Europa Clipper orbiter is below. The Europa Clipper mission aims to investigate whether the Jupiter moon could harbor conditions suitable for life. The project plans to launch a spacecraft in the 2020s, place it in orbit around Jupiter, and conduct a series of investigatory flybys of Europa. The mission’s planned objectives include characterizing Europa’s ice shell and any subsurface water, analyzing the composition and chemistry of its surface and ionosphere, understanding the formation of its surface features, and surveying sites for a potential landed mission. We did not assess the proposed Europa lander mission, which NASA is managing as a separate project in pre-formulation. Launch Location: Kennedy Space Center, Fla. The Europa Clipper project plans to hold its preliminary design review in August 2018 and its confirmation review in October 2018 on schedule, at which point the project will establish its cost and schedule baselines. The project implemented a process to manage instrument costs with options to descope an instrument entirely or in part but has not descoped any instruments to date. The project continues to work toward a June 2022 launch but the availability of a qualified and well-understood launch vehicle could affect that schedule. The project is maintaining compatibility with multiple launch vehicles as it awaits NASA’s selection. The project is evaluating design options that may affect the mass and power needed to operate the spacecraft and its 10 instruments. The project has experienced workforce shortages since October 2016, but has seen recent improvements. The project is currently holding cost reserves consistent with Jet Propulsion Laboratory (JPL) policy, but is not meeting JPL’s schedule reserve requirement due to technical issues with solar array development. 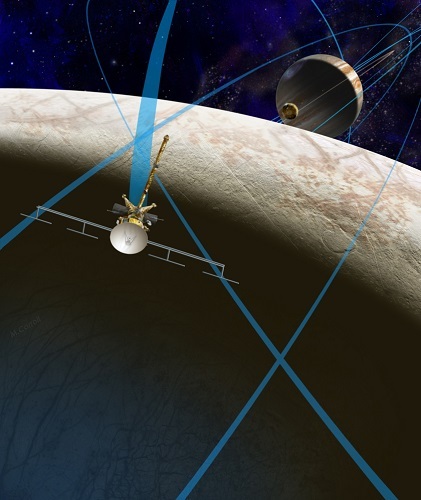 In February 2017, NASA approved the Europa Clipper project to proceed with preliminary design and technology completion, but the project’s independent review board highlighted that the complexity and scope of the current 10 instruments may cause cost and schedule growth. In response, the project proposed and NASA approved a process to manage instrument costs with options to descope an instrument entirely or in part to prevent cost growth. For example, if an instrument exceeds its development cost by 20 percent, the project would propose a descope option to NASA that brings instrument cost below that threshold. NASA has not descoped any instruments to date. The project is currently holding cost reserves consistent with JPL policy, but is not meeting JPL’s schedule reserve requirement due to technical issues with solar array development. In March 2017, the project discovered that the materials it planned to use on its solar arrays did not meet requirements under low temperatures. As a result, the project changed the materials it plans to use and is exploring using a different vendor for the solar arrays. Project officials said the technical issues and the project’s actions to mitigate them delayed delivery of the solar arrays 3 months beyond the project’s baseline need date. However, project officials said the baseline need date was earlier than the actual need date for solar array integration. As a result, the project is reassessing the integration and test flow and may be able to recover some schedule reserves. The project plans to hold its preliminary design review in August 2018 and its confirmation review in October 2018 on schedule, at which point the project will establish its cost and schedule baseline. has trade-offs that affect development. The Consolidated Appropriations Act, 2016 requires the project to use SLS; however, recent SLS schedule delays could result in a delay to Europa Clipper’s planned June 2022 launch readiness date unless NASA adjusts its current plans for SLS and the associated ground systems. Project officials support using SLS as the launch vehicle, even if it delays the planned launch, because SLS allows a direct flight to Jupiter. This path could reduce the travel time by approximately 4.5 years compared to other launch vehicle options. The project is currently meeting JPL mass and power margin requirements, but is evaluating design options that may affect the mass and power needed to operate the spacecraft and its 10 instruments. For example, accommodation of the ice-penetrating radar has been difficult because it requires a higher-than-expected amount of power that could lead to design trades. To mitigate this risk, the project is conducting additional testing of the instrument to evaluate compatibility at lower levels of power. The project is also evaluating design options for its solar arrays, which project officials said will increase available power but may also increase mass. The project experienced workforce shortages at JPL in several key areas since October 2016. The project has revised staffing plans several times, but the project continues to face workforce shortages even with NASA headquarters involvement. As of January 2018, project officials reported that improvements have been seen in addressing workforce shortages. Other JPL projects have experienced workforce issues as well, which NASA attributes to the amount of work the laboratory is managing.